Sign up and receive Property Email Alerts of Villas for sale in Soneva Jani, Maldives. Soneva Jani, located in Noonu Atoll on the island of Medhufaru, is built on one of the largest islands in the Maldives and surrounded by four smaller islands in the middle of a beautiful, five- kilometre turquoise lagoon. Four of the five islands remain untouched meaning it is, by far, the lowest- density development in the Maldives. With crystal clear waters, white sand beaches and a breezy tropical climate, Soneva Jani is only 35 minutes by seaplane from Malé International Airport and one hour by speedboat from Soneva Fushi. With a total area of 625 sqm, this two-storey, three-bedroom Water Retreat on the sunset side of the island offers gracious living. Upon entry, there is a breath-taking vista of the turquoise lagoon on the horizon with a very spacious master bedroom to one's left. The master bedroom is complete with a spacious dressing room, a study room, a beautiful bathroom with a sunken bathtub, the Soneva signature outdoor shower, and a separate sleeping area for the children. To the right, is a guest bedroom of equal size, complete with an en-suite indoor-outdoor bathroom. Walk out to the massive outdoor deck of the villa, with its magnificent 12-metre-long lap pool and ample outdoor seating for you to enjoy some magical moments with all your loved ones. To the right is the water slide, which none of the guests who stay in the villa is too young or too old to enjoy. Venture to the second floor where the view is as mesmerising as ever. This floor houses a third bedroom with the signature retractable roof, complete with an en-suite bathroom with a wooden bathtub. The floor also has a TV lounge and your own private gym. Most of Soneva Jani's guest facilities are located at the Gathering - an overwater, three-storey building that houses the majority of the Food and Beverage outlets, including So Fresh with a bar and musician platform, So Imaginative tasting room, So Engaging chef's table, So Cool, and outdoor dining areas such as So Starstruck and Deckadence. All Soneva Jani chefs prepare mouth-watering, healthy and balanced dishes using only the freshest produce, much of which is grown in the resort's own organic fruit and vegetable gardens, and served in memorable and exceptional settings. The Gathering is also home to the Shop, Yoga Pavilion, Spa, the Gym and the Den. 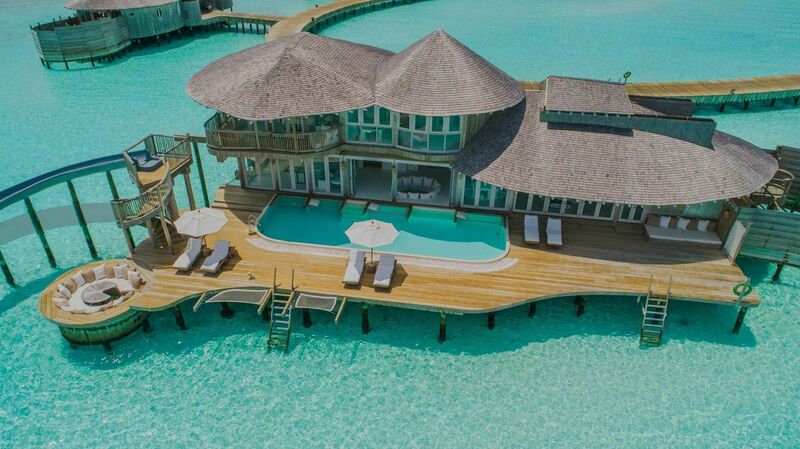 Sign-up and receive Property Email Alerts of Villas for sale in Soneva Jani, Maldives.